Users that enable the "Pro" version can view Trello card custom fields in reports. Look under report "Options" to enable custom fields. Custom fields of "Number" or "Checkbox" types are summed-up when grouped. Some report groupings can cause a grouped row to contain multiple rolled-up rows of the same card. In those cases Plus will not double-sum those card rows custom field numeric values. Its also possible to have the same card appear in multiple grouped rows. In those cases the custom field column will repeat the card values once in each grouped row that contains the card. Thus consider that when summing the entire custom field column (on an exported spreadsheet, for example) it may contain duplicate values. The most common case for these duplicates is when grouping by "labels" or by "s/e user" since a card can have multiple labels or s/e users. Plus does not yet support offline custom fields. Instead it will get the field values from Trello every time you query such report or chart. To make the report faster make sure to filter just the rows you need by picking a date range, specific boards or cards and so on before clicking "Query". 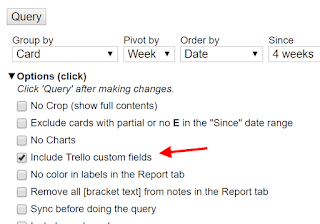 Custom fields columns are always added to the right of the report, ordered alphabetically. 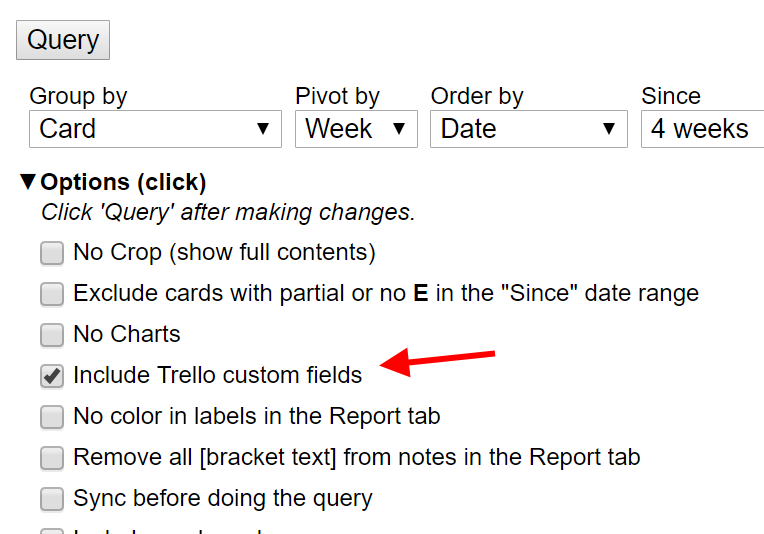 We do not yet support picking which custom fields to show or their order from the "custom columns" report option. More report and charts help.